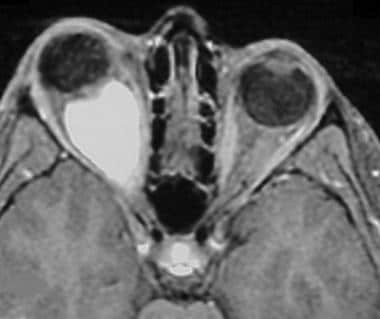 Coronal noncontrast T1-weighted MRI reveals a large intraorbital mass (arrow) centered on the optic nerve. 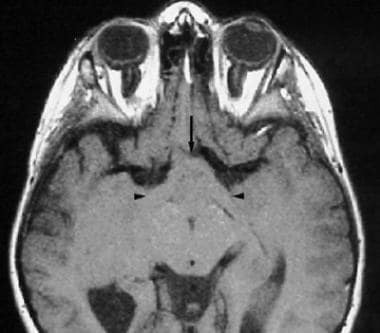 Axial T2-weighted MRI in a 46-year-old man demonstrates a mass in the lateral geniculate nucleus of the thalamus resulting from contiguous extension of the patient's known optic nerve glioma. See Brain Lesions: 9 Cases to Test Your Management Skills, a Critical Images slideshow, to review cases including meningiomas, glioblastomas and craniopharyngiomas, and to determine the best treatment options based on the case history and images. Gadolinium-based contrast agents have been linked to the development of nephrogenic systemic fibrosis (NSF) or nephrogenic fibrosing dermopathy (NFD). For more information, see the eMedicine topic Nephrogenic Systemic Fibrosis. The disease has occurred in patients with moderate to end-stage renal disease after being given a gadolinium-based contrast agent to enhance MRI or MRA scans. NSF/NFD is a debilitating and sometimes fatal disease. Characteristics include red or dark patches on the skin; burning, itching, swelling, hardening, and tightening of the skin; yellow spots on the whites of the eyes; joint stiffness with trouble moving or straightening the arms, hands, legs, or feet; pain deep in the hip bones or ribs; and muscle weakness. For more information, see Use of Gadolinium in MRI and MRA Linked to NSF/NFD in Patients With Renal Failure. Although MRI may reveal even subtle lesions of the optic nerve, CT scanning can detect a subtle erosion or expansion of the optic canal. In addition, fine calcification, which may help to identify a lesion as a meningioma rather than a glioma, is visualized best through CT scanning. In children, unenhanced CT scans typically reveal a marked, diffuse enlargement of the optic nerve, with characteristic kinking or bending. The enlargement may be tubular, fusiform, or excrescent. Areas of lucency may result from mucinous or cystic changes. Approximately 50% of the lesions demonstrate enhancement; this characteristic is more common with intracranial (especially retrochiasmatic) extension. Calcifications are rare. The diagnosis may be made with a high degree of confidence when the lesion involves the optic chiasm and retrochiasmatic optic pathway. When confined exclusively to the orbit, the lesion may mimic optic neuritis or optic nerve meningioma; in this setting and in most instances, MRI is a better diagnostic tool than is CT scanning. CT scanning is the better modality for identifying uncommon meningioma with flecks of calcification, which are rare in optic nerve glioma. False-positive results can occur because of unilateral optic nerve enhancement or other unilateral disorders, such as optic meningioma, vascular lesions, neuritis, pseudotumor, and sarcoidosis. In addition, subtle nerve enhancement occasionally may develop in normal individuals. Improper examination techniques, including failure to administer contrast or obtain thin sections, can lead to a false-negative diagnosis. 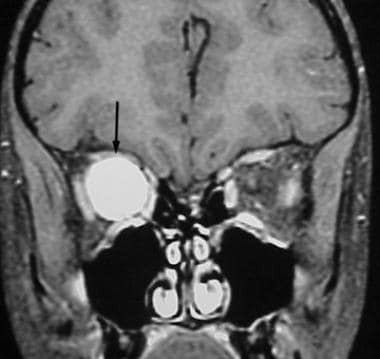 Coronal postgadolinium T1-weighted MRI with fat saturation reveals diffuse, intense enhancement of the intraorbital mass (arrow). 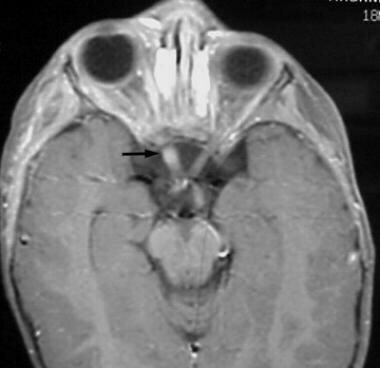 Axial postgadolinium T1-weighted MRI with fat saturation reveals diffuse, intense enhancement of the intraorbital mass. The lesion is confined to the orbit. 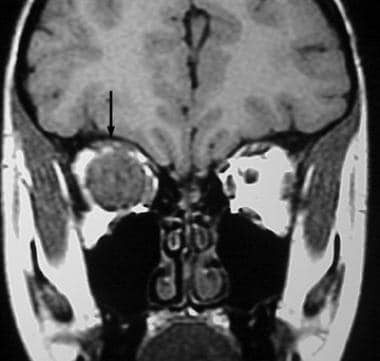 Axial postgadolinium T1-weighted MRI with fat saturation in a 6-year-old girl demonstrates enhancement of the intracranial optic nerve (arrow), which is slightly expanded. Axial noncontrast T1-weighted MRI reveals bilateral, fusiform enlargement of the optic nerves (arrows) in a 14-year-old patient with neurofibromatosis type 1, consistent with bilateral optic nerve gliomas. 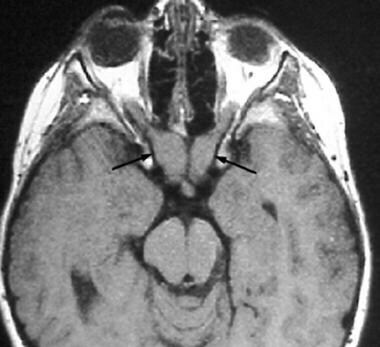 Axial noncontrast T1-weighted MRI in a 46-year-old man demonstrates enlargement of both optic tracts (arrowheads) and the optic chiasm (arrow). Usually, the lesions are hypointense to isointense relative to the optic nerve on T1-weighted images and are hyperintense to it on T2-weighted images. Enhancement is uniform and intense. The diagnosis may be made with a high degree of confidence when the lesion involves the optic chiasm and retrochiasmatic optic pathway. When confined exclusively to the orbit, the lesion may mimic optic neuritis, pseudotumor, lymphoma, or optic nerve meningioma. Classically, meningioma, the primary differential diagnostic consideration, is characterized by the "tram-track" sign, with enhancement of the periphery of the nerve–optic sheath unit. On the other hand, enhancement in optic nerve glioma is more uniform. Isolated enlargement of the optic nerve sheath also may present diagnostic difficulty; however, this enlargement can usually be distinguished by its signal characteristics, which follow fluid signal on all MRI pulse sequences. In most instances, including those described above, the diagnosis can be made with greater confidence using MRI than it can with CT scanning. A false-positive diagnosis can occur as a result of unilateral optic nerve enhancement or other unilateral disorders, such as optic meningioma, vascular lesions, neuritis, pseudotumor, lymphoma, and sarcoidosis. In addition, subtle nerve enhancement occasionally may develop in normal individuals. Improper examination techniques, including failure to administer contrast, use fat saturation, or obtain thin sections, can result in a false-negative diagnosis. Wilhelm H. Primary optic nerve tumours. Curr Opin Neurol. 2009 Feb. 22(1):11-8. [Medline]. Rolston JD, Han SJ, Cotter JA, El-Sayed IH, Aghi MK. Gangliogliomas of the optic pathway. J Clin Neurosci. 2014 Dec. 21 (12):2244-9. [Medline]. Glass LR, Canoll P, Lignelli A, Ligon AH, Kazim M. Optic nerve glioma: case series with review of clinical, radiologic, molecular, and histopathologic characteristics. Ophthal Plast Reconstr Surg. 2014 Sep-Oct. 30 (5):372-6. [Medline]. Aoki S, Barkovich AJ, Nishimura K, et al. Neurofibromatosis types 1 and 2: cranial MR findings. Radiology. 1989 Aug. 172(2):527-34. [Medline]. Hendrix LE, Kneeland JB, Haughton VM, et al. MR imaging of optic nerve lesions: value of gadopentetate dimeglumine and fat-suppression technique. 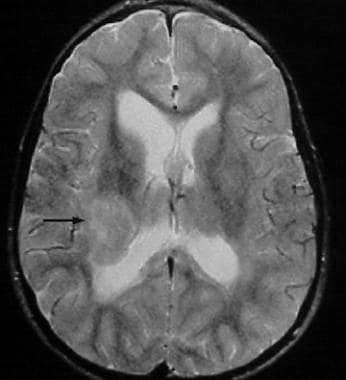 AJNR Am J Neuroradiol. 1990 Jul-Aug. 11(4):749-54. [Medline]. Messori A, Salvolini U. Hybrid phakomatosis: from initial CT observation to molecular studies. AJNR Am J Neuroradiol. 2004 Aug. 25(7):1297-8. Forte R, Cennamo G, Breve MA. Three-Dimensional Ultrasound of Ophthalmic Pathologies. Ophthalmologica. 2009 Jan 31. 223(3):183-187. [Medline]. Walrath JD, Engelbert M, Kazim M. Magnetic resonance imaging evidence of optic nerve glioma progression into and beyond the optic chiasm. Ophthal Plast Reconstr Surg. 2008 Nov-Dec. 24(6):473-5. [Medline]. Buffa A, Vannelli S, Peretta P. [NF1 and gliomas: the importance of the MRI]. Minerva Pediatr. 2008 Apr. 60(2):259-60. [Medline]. Khan SN, Sepahdari AR. Orbital masses: CT and MRI of common vascular lesions, benign tumors, and malignancies. Saudi J Ophthalmol. 2012 Oct. 26(4):373-83. [Medline]. [Full Text]. Menjot de Champfleur N, Leboucq N, Menjot de Champfleur S, Bonafe A. Imaging of the pre-chiasmatic optic nerve. Diagn Interv Imaging. 2013 Oct. 94(10):973-84. [Medline]. Spicer GJ, Kazim M, Glass LR, et al. Accuracy of MRI in defining tumor-free margin in optic nerve glioma surgery. Ophthal Plast Reconstr Surg. 2013 Jul-Aug. 29(4):277-80. [Medline]. Shofty B, Mauda-Havakuk M, Weizman L, Constantini S, Ben-Bashat D, Dvir R, et al. The effect of chemotherapy on optic pathway gliomas and their sub-components: A volumetric MR analysis study. Pediatr Blood Cancer. 2015 Aug. 62 (8):1353-9. [Medline]. Avery RA, Hwang EI, Ishikawa H, Acosta MT, Hutcheson KA, Santos D, et al. Handheld optical coherence tomography during sedation in young children with optic pathway gliomas. JAMA Ophthalmol. 2014 Mar. 132 (3):265-71. [Medline]. Kornreich L, Blaser S, Schwarz M, et al. Optic pathway glioma: correlation of imaging findings with the presence of neurofibromatosis. AJNR Am J Neuroradiol. 2001 Nov-Dec. 22(10):1963-9. [Medline].